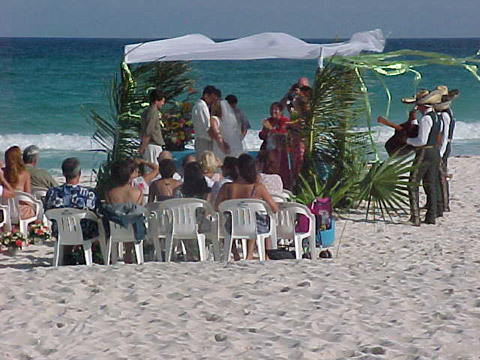 Weddings: We specialize in Destination Beach Weddings!Planning a big wedding? Rent the neighborhood; together we can sleep over 200 people in our various Vacation Rentals! 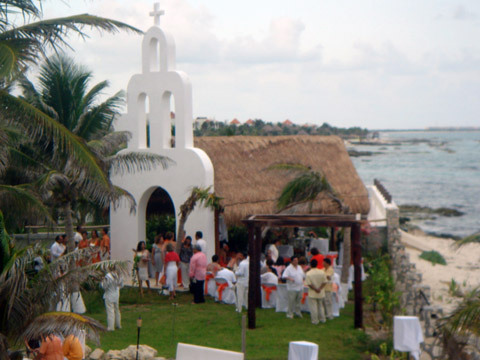 Chapel Santa Maria del Secreto is the Only Catholic Chapel by the sea in the Mayan Riviera. Built on a beach where you have the privacy of just own group at the wedding without a crowd of tourist looking in. 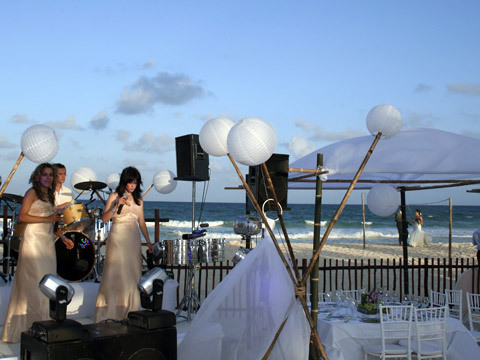 The location includes: the Chapel, a Palapa that can hold up to 120 guests and the Coconut Grove Beach Front that can set another 250 people. The facility also has a Bridal Suite; so the bride has a place to get ready for the big day with the comfort and luxury she deserves. 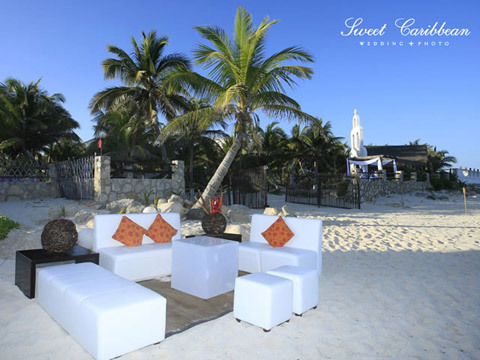 Our venue is designed for the intimate beach wedding you have been looking for, plus the owner is a Certified Destination Wedding Specialist; so you are assured a hassle free wedding in Paradise! Our guests love walking down our jungle path, arriving to the big Palapa, and then crossing over our Cenote on a bridge that leads you to the Beach Front Coconut Groove and Chapel overlooking the ocean. 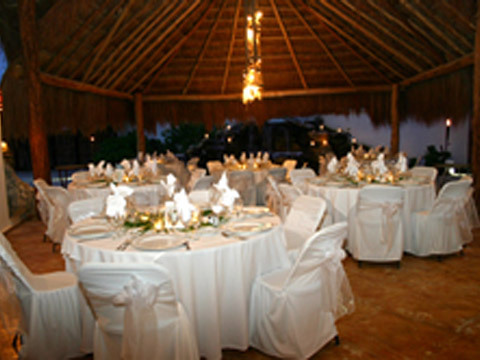 Weddings are magical at beautiful Hacienda del Secreto. 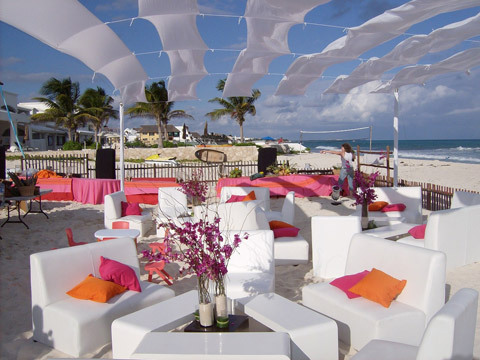 We will help make possible whatever your heart desires and can coordinate large or small weddings, followed by simple or elaborate receptions. 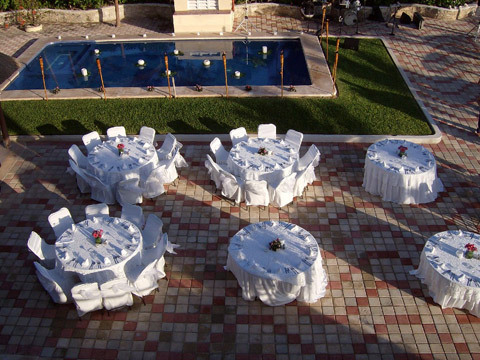 Hacienda del Secreto is a private small compound and we can coordinated rental homes for up to 90+ people. 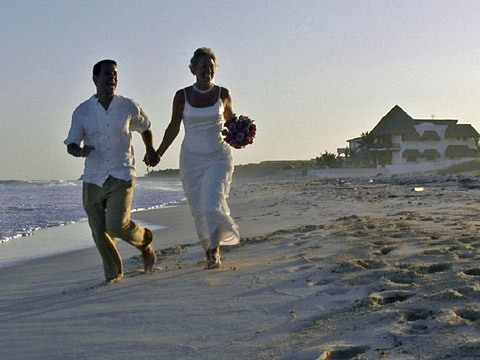 51 people can stay at Hacienda del Secreto alone! It is like living in the same tiny town together with everyone you love. 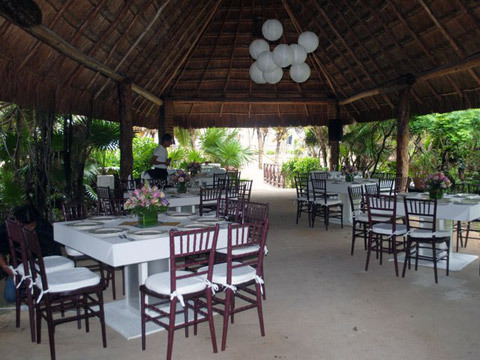 Hacienda del Secreto's Event Palapa is available to host weddings for up to 200 people, it is fully equipped with professional sound system, wireless microphones, cable TV, and Karaoke. 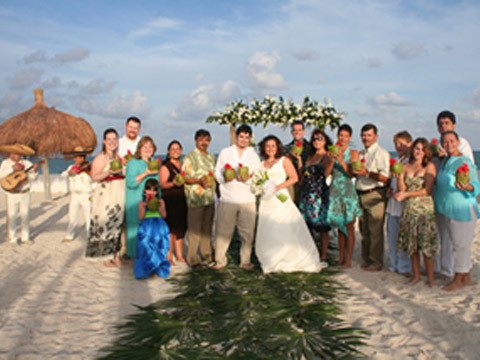 Our wedding coordinator can assist with all aspects of your destination wedding, from Mexican marriage licenses to flowers. She will help you navigate the Mexican legal paperwork and find an efficient for the service and will handle all your catering needs. 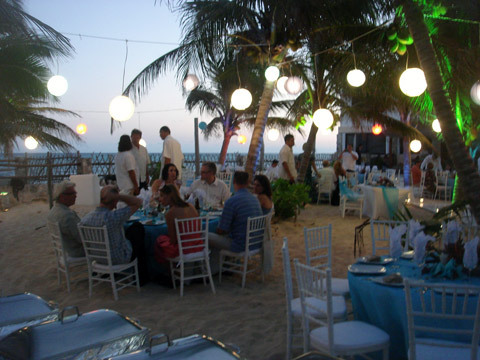 The Secret Beach Villas; a perfect locations for a Wedding Combined Vacation where your family and friends are together at the 11 bedroom Vacation Rental with plenty of room relax before the big day. 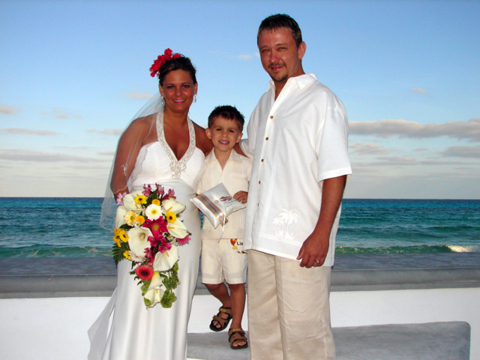 Suited for a smaller and a simpler wedding of 30 or so people, we have had many second marriages and vow renewals. 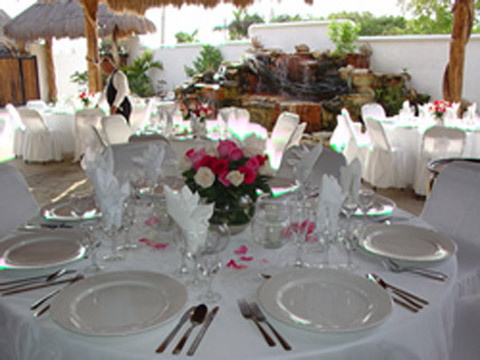 The owner Chef Mateos will be happy to prepare the reception dinner of your specifications. 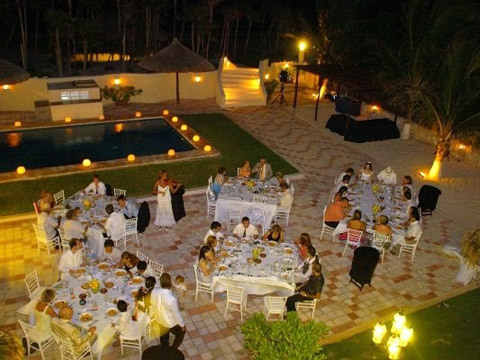 If you are looking for a bigger wedding we are adjacent to Hacienda Secreto and have an adjoining doorway between the properties, over the years many larger weddings have booked both properties together. Picture you and your loved one standing barefoot on an impeccable white sand beach while the turquoise sea laps at your toes. 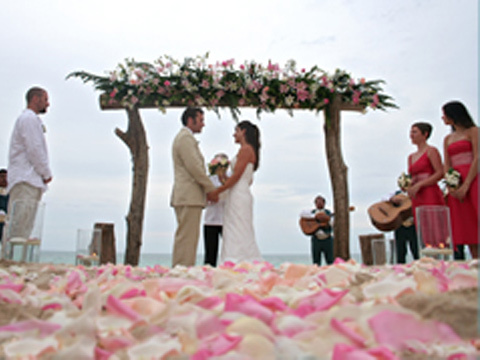 A flower entwined arbor arching above you exudes delicate scents of love as you join your lives together forever. There is a paved patio at pool side that is wonderfully intimate. While palm trees wave gently in the breeze and floral bouquets bob in the pool, you'll promise to love and honor one another for eternity. 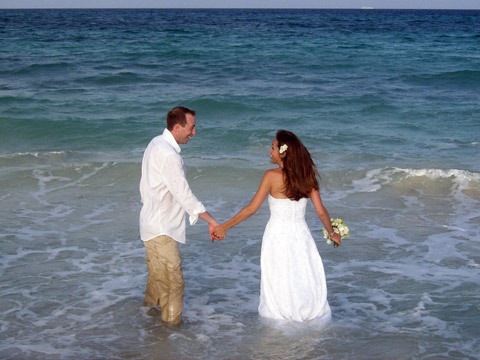 As a full service villa, our staff will make all the bride's wishes come true. 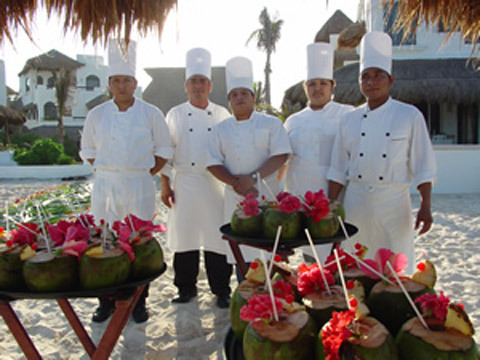 The villa concierge may help you to coordinate: Medical lab test , hiring a minister , beauty salon service, facials, massages, live music, catering, table and alter decorations to insure you can enjoy such a special moment. 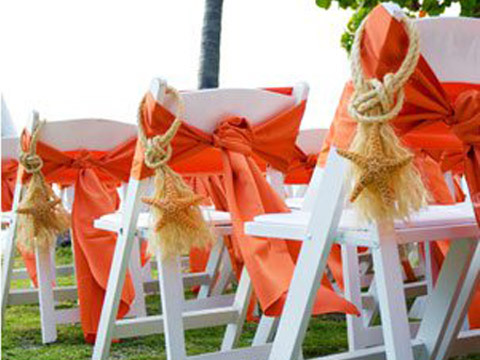 Or, if you prefer, one of our wedding consultants may be hired to take care of all the details that create an outstanding wedding experience. This area was First Home to the Sea Turtles, Land Crabs, Iguanas, and Crocodiles long before the first home was built. We strive to leave as Little Impact on our Environment as we can; so we can Sustain the natural surroundings we share with Playa del Secreto's Wildlife. "Leave only Foot Prints, Take only Photos"
Copyright © 2011 - Playa del Secreto Association - All rights reserved.